Heat the oil in a large non-stick frying pan. Add the leeks and 2 tbsp water, and cook for about 10 mins until very soft. Add the bacon, turn up the heat and fry until cooked. Meanwhile, cook the pasta following pack instructions. Drain and reserve a mug of the cooking water. 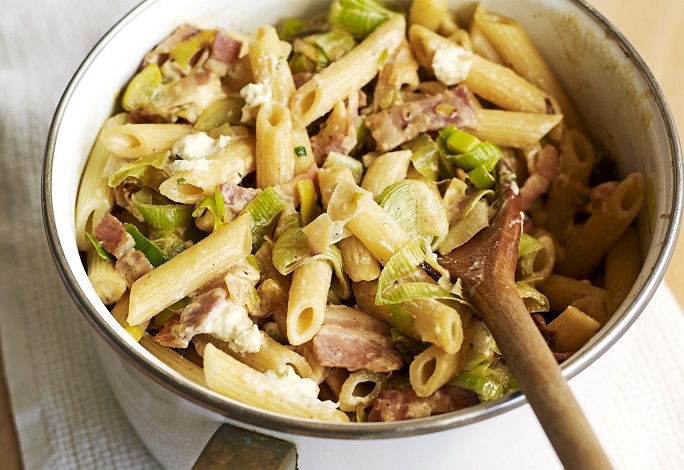 Spoon cheese into the leek and bacon mix, adding some of the reserved cooking water. Season and stir gently over a low heat until melted. Toss through the cooked pasta, adding a little more cooking water, if needed, to help the sauce coat the pasta.